Through this post, we shall be updating you with the New Interest Rates on Post Office Schemes. The interest rates keep on getting revised every quarter. 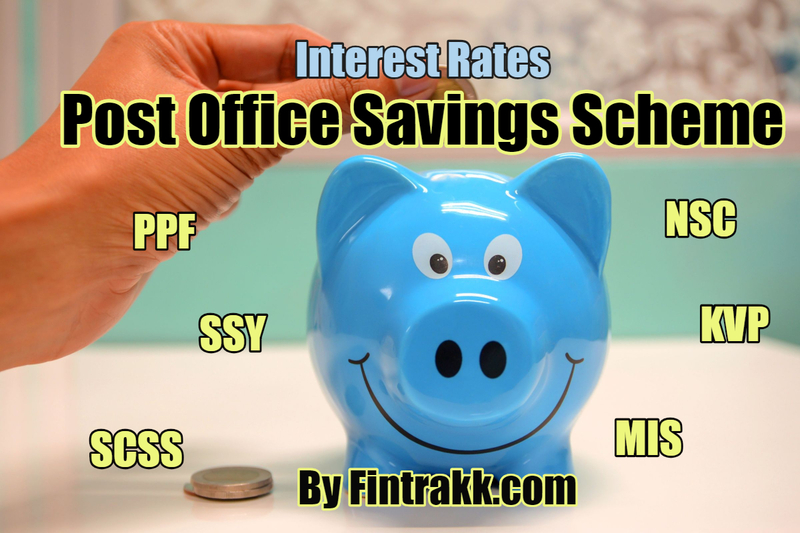 And, you might be keen on learning the latest interest rates on different Post office Savings schemes in India. So, we thought of sharing data related to present interest rates alongwith rates for the previous quarters as well. This can help you know the recent changes in Post office interest rates. Therefore, you can make a comparison of fluctuations in the Post Office new interest rates and old interest rates. So, don’t miss to checkout our Post Office Interest rates Comparison table as you read further. In fact, we shall be adding new interest rates every time there’s any revision to it. So, keep visiting to grab useful information on Post Office Saving Schemes and interest thereon. Post Offices in India offer a set of popular investment schemes. You can choose the one based on your financial priorities. Now, that you know the different schemes provided by India Post offices, let’s go through the latest interest rates. 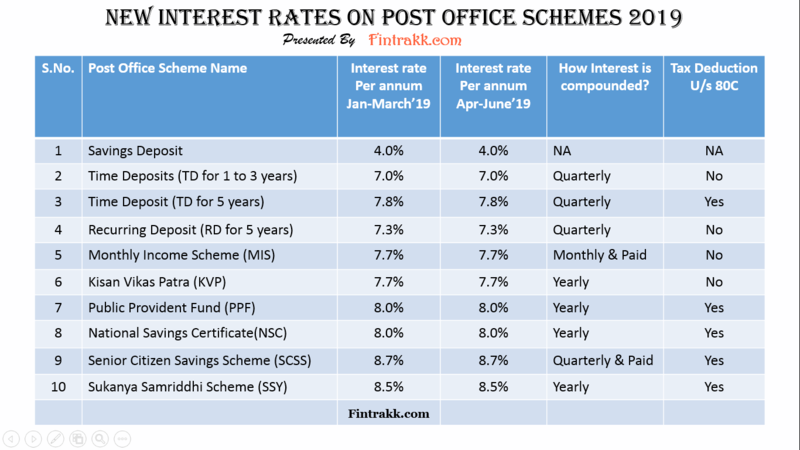 The interest rates on Post office schemes for the first quarter of financial year 2019-20 i.e. 1st April to 30th June 2019 remain unchanged. This means, same rates apply as for the previous quarter of January to March 2019. ALSO READ EPF UAN Correction: How to update name, date of birth details online? Here’s a picture showing additional information on How interest is compounded on these Post office saving schemes? Can you avail a tax deduction under Section 80C of The Income Tax Act, if you invest in these small saving schemes in India? 1. Interest rates on these Post Office schemes are reviewed and fixed every quarter by the Government. 3. For Public Provident Fund(PPF) and Sukanya Samriddhi Yojana (SSY), the revised interest rates for every quarter shall be applicable. Therefore, the newer interest rates shall apply for different quarters. No doubt, these Post Office Saving Schemes provide a safer investment alternative to the risk averse investors. In addition to it, a decent fixed return is the main point of attraction towards such saving schemes. Moreover, the tax benefit associated with many of these Post Office Schemes is definitely going to attract investors in future as well. Therefore, looking at the market volatility and uncertain returns of other long term investment options in India, these Post Office Saving Schemes surely have advantage for the safe players. What do you think? Do you like investing in Post Office Saving Schemes? If yes, which one do you prefer? Are you satisfied with the new interest rates being offered on these Post Office Schemes? Or do you wish to get still better returns on the Small Saving Schemes in India? Feel free to share your opinions on the same below or you may join our free investment discussion forum.